The defining feature of colonial Queensland was its high immigrant population. 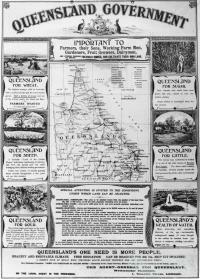 In a concerted effort to populate the land with European settlers, Queensland’s colonial administrators had enacted a pioneering immigration policy between 1860 and 1901, allowing Queensland to claim the highest percentage of foreign-born residents of all the Australian colonies in 1891. As well as the multitude of English, Irish, Scottish and German settlers that accepted governmental offers of open land and assisted passage, there was also a significant Scandinavian element that would call Queensland home. At its recorded peak in the 1886 census, some 5756 Swedes, Danes, Norwegians and Finns had settled in ‘Sunney Queensland’, and these numbers would remain high until the outbreak of World War I according to historian Olavi Koivukangas. The Scandinavians that arrived in Queensland were part of a much larger diaspora that had its beginnings as early as 1825, when the first pioneering groups of Norwegian migrants left for new homes in the United States of America. 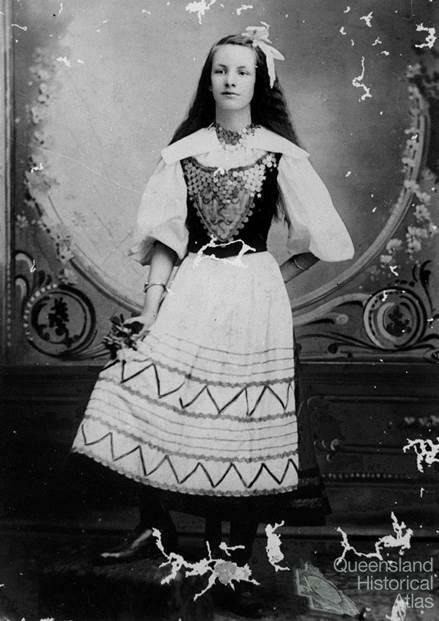 While the reasons for Scandinavian emigration were complex, the majority of these migrants were economic in focus; that is, they eschewed an underdeveloped, overpopulated, poverty-stricken Scandinavia and instead sought new opportunities in the flourishing settler societies of the United States, Canada, South Africa, New Zealand, and Australia. Over the next century, over 2.8 million people emigrated from their Nordic homelands in search of a better life overseas. According to Koivukangas, more than 95% of these Scandinavian emigrants went to the United States, because, as Marcus Lee Hansen wrote in 1945, Australia was ‘too remote from Europe, too primitive a region and too expensive to reach. By contrast, those who sought the United States prospered, soon developing flourishing communities’. Despite this, some adventurous migrants still saw Australia as a potential place for resettlement, especially after gold discoveries in Victoria and Queensland in the 1850s claimed those colonies as an easy place to make one’s fortune. Ellen Paulsen notes that Australia became a more hospitable choice for Scandinavians later in the nineteenth century, once influenced by the accounts of explorers and scientists visiting Australian shores, such as Swedish naturalist Erik Mjöberg and Norwegian zoologist Carl Lumholtz. What a motley crew we were: Germans, Danes, Swedes, Norwegians, a Russian Finn, and an Icelander. There were many nationalities, but in the majority of cases extreme poverty was evident in their dress and stamped upon their faces, and it was easy to see that the same spirit of recklessness which filled me had somehow also been instilled into them. 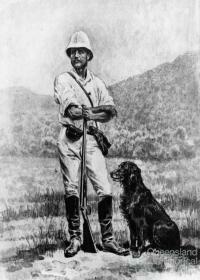 Nearly everybody had guns, revolvers, and knives, which were promptly taken from us as we stepped on board … None of us knew anything about Queensland, and many were the surmises and guesses at what the country was like and what we were going to do there. In terms of Australian settlement, by the 1870s Queensland had become the prime focus of many of these Scandinavian sojourners. Following the arrival of the first assisted Scandinavian contingent to Maryborough in August 1871, immigrant numbers increased at an astonishing rate. According to Koivukangas, in the decade between 1871 and 1881, the Scandinavian population of Queensland more than trebled from 936 persons to 3278, and only four years later in 1886, numbers had increased five-fold to peak at 5756. 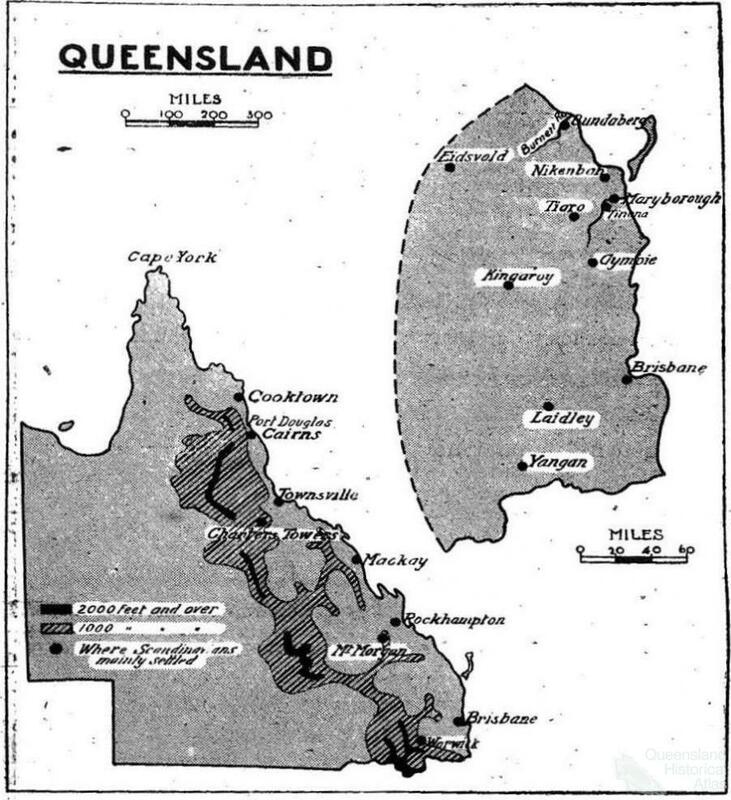 On arriving in Queensland, new immigrants disembarked at several of the main ports, including Brisbane, Maryborough, Mackay, Bundaberg and Townsville, where they were lodged in immigration depots before gaining employment and then, according to Jens Lyng, ‘being broadcast over the Coastal Belt and Darling Downs’. By 1901, Queensland was home to more than half the Danish population of Australia, with some 3138 Danes residing in the state. While New South Wales and Victoria were home to the majority of Swedes and Norwegians, roughly a quarter called Queensland home, with 2142 combined. From these figures, it can be seen that a large proportion of those Scandinavians reaching Australia at this time came directly to Queensland, a place which at the time was not as developed, nor as enticing as the large colonial cities of the southern states. 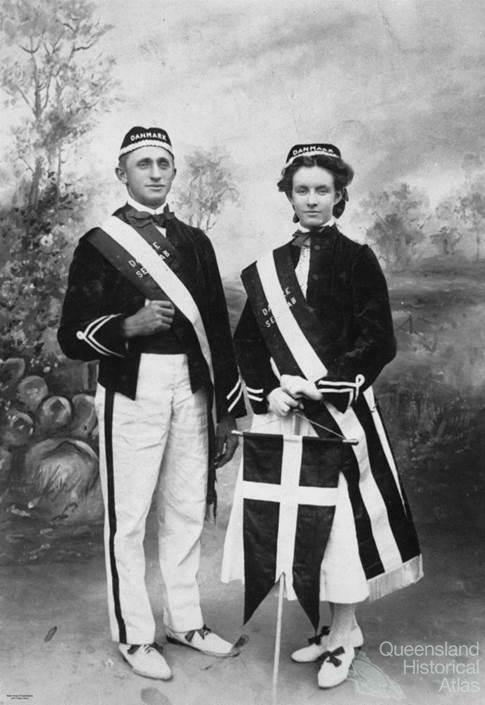 With most of Queensland’s Scandinavians being of rural and agricultural origin – and often destitute, requiring assistance to make the journey – they were particularly suited to taking up the government’s offer of land, eventually selecting plots and founding small farming settlements in the pioneering south-east corner of the state, particularly near Bundaberg, Mackay, Nikenbah, Pialba, Tiaro, Tinana, Kingaroy and Laidley. Other skilled migrants remained in the towns as craftspeople or traders, while many others became involved in mining, settling in substantial numbers near the goldfields of Charters Towers, Gympie, Mount Morgan and the Palmer River. I was one of the Danes who in 1875 selected land in the Pialba district. We were upwards of forty Scandinavian families, and more arrived later. Most of these early settlers are there still. The dense forest has disappeared, and the district presents a beautiful landscape covered with luxuriant fields of maize, sugar plantations, and vinyards. – In the Mary valley are many Scandinavian farmers of whom several are orchardists and wine growers on a large scale. Between 1870 and 1890, this strong flow of northern European migrants enabled vibrant social organisations to grow and potential ethnic communities develop in colonial Queensland. In many ways Lyng was correct; the large concentrations of Scandinavians in Queensland towns and farming communities did, at least for a time, encourage widespread cultural and social activity among migrants keen to reconnect with others from their ancestral homelands. Most, however, did not last. 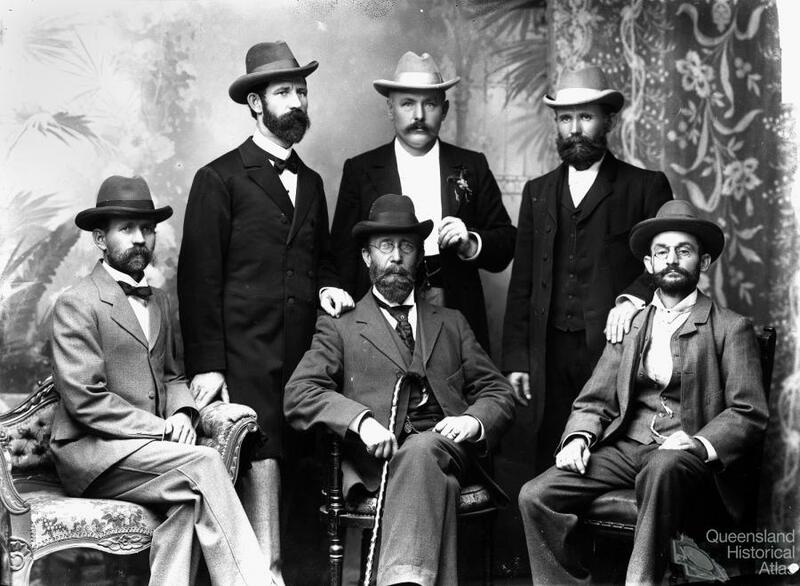 The 1870s marked the beginning of a period of increased numbers of both migrants and so-called ‘Scandinavian’ associations, starting with establishment of the Scandinavian Association Heimdal in Brisbane in September 1872. These early associations grew from the desire for migrants to join forces under the practical umbrella of pan-Scandinavianism, to promote an environment of friendship, co-operation, support and social welfare for migrants of all three nationalities. They also mirrored the experiences of those migrants who had arrived in the United States between 1840 and 1890, where the early years of mass migration had seen concerted efforts to create a sense of pan-Scandinavian ethnic identity within North American communities due to relatively small numbers of Scandinavian immigrants, and the natural tendency for Danes, Norwegians and Swedes to seek each other out in an unknown and alien society, according to historian Dag Blanck. Across Queensland, the influx of assisted migrants from 1871 onwards allowed for the formation of Scandinavian associations in the migrant-laden townships of Maryborough (1871-72), Rockhampton (1873), and Charters Towers (1880s). Often beginning as friendly societies to provide sickness benefits to members, most of these early Scandinavian societies evolved into social associations after realising their inability to compete with larger Australian benefit funds. In this newly adapted social role, the associations of Queensland enjoyed a high level of membership for a brief period, with Maryborough and Charters Towers maintaining approximately 60 and 40 members, respectively, at their peak in the late 1880s. The very fluid nature of Queensland’s migrants – continually searching for viable economic ventures – meant that many of these organisations could not rely on a stable membership base. The shifting employment opportunities within the gold-mining communities of Rockhampton and Charters Towers in particular hampered Scandinavian societies’ growth as members were forced to move into and out of the region. Most of these societies, bar Heimdal, had folded by 1901. The Scandinavian societies of Queensland proved a rallying point for the colonies’ Nordic immigrant population. Brisbane’s Heimdal was particularly influential in establishing a sense of community through social events, picnics, and balls. In 1882, Danish cabinet-maker and Heimdal member, Peter Thomle, introduced the sport of target birdshooting (Fugleskydning) to Queensland, where it was taken up as an important migrant social event and spread to other colonial centres. Heimdal eventually grew strong enough to link Queensland’s Nordic communities to other Scandinavian clubs interstate, notably by maintaining a strong connection to the Scandinavians’ important mouthpiece, Melbourne’s foreign-language newspaper Norden. In March 1898, Norden brought news of Brisbane’s annual Fugleskydning, held at a Mr Sørensen’s property, Mt Gotha, to the attention of the wider Scandinavian readership as a demonstration of what could be achieved socially by the migrant community: ‘It was a good muster of members, and the atmosphere was animated’, wrote the Norden correspondent. Describing the masses of flags and pennants among the happy Scandinavians and their ‘mighty eagle’, Norden painted an impressive picture of Brisbane’s migrants coming together to recreate the culture of their past while connecting both rural and urban migrants. As well as this, the metropolitan migrants who were able to frequent these clubs were often involved in picnics, masquerade balls and parties. 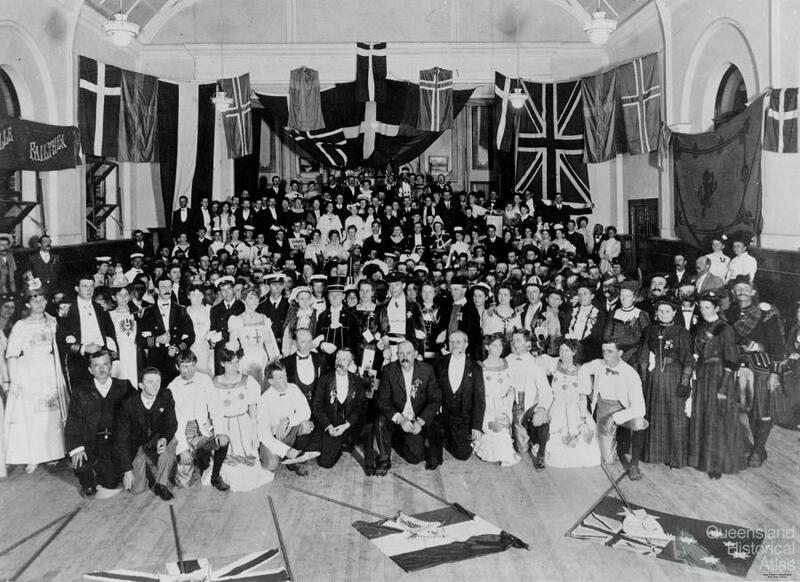 On 23 May 1899, for example, a complementary benefit concert and ball was arranged in the Brisbane Trades Hall to commemorate Norden’s third anniversary, being orchestrated by the Scandinavian Association Heimdal and the Consuls of both Denmark and Sweden/Norway. Many of Queensland’s small Scandinavian communities also desired their own Lutheran Church services in order to appease migrant needs of spiritual fulfilment and abate feelings of guilt and homesickness. Administering to such a fragmented flock was, however, difficult for the few Scandinavian ministers present in Queensland in the 1870s and 1880s – most were missionaries, and therefore often unable or unwilling to stay in one community as they tried to spread the word of god to as many dispersed settlers as possible. When no ordained Scandinavian Lutheran ministers were available, a group of lay preachers administered over half a dozen small congregations in Brisbane, Mackay, Maryborough, Nikenbah, Tiaro, and Tinana. According to Lyng, the situation was dire and, while ‘non-descript lay-preachers plodded wearily on, to the best of their ability heartening the dispirited Scandinavian Christians … the Scandinavian congregations in Queensland had become a disjointed collection of small, leaderless, groping units’. Unable to procure more ministers from Scandinavia, many migrants simply began to accept the ministrations of other protestant denominations, in order to gain more regular and stable guidance. Forced to seek religious refuge among the larger German congregations, the uniting sentiments of Lutheranism enabled church congregations drawn from various nationalities to be considered, and fill the void left by a lack of Scandinavian Pastors. In fact, many Scandinavian congregations often arose as offshoots from German groups, by Scandinavian preachers already involved and employed in the larger German Church. Pastor C. Gaustad, for example, who had trained in Norway and Germany, came to Brisbane to administer to German migrants in 1869 but soon was preaching in Norwegian to Scandinavian groups within the German church. After relocating to Mackay, Gaustad was intent on fostering a united Lutheran identity, and established a combined German-Scandinavian parish there. Transnational Lutheranism was particularly strengthened in Queensland with the creation of the United German and Scandinavian Lutheran Synod of Queensland in 1885. However, friction within such ‘united’ church groups – especially as many Danish members shared strong anti-German sentiments due to the Dano-Germanic conflicts of the 1860s – undermined their efficacy. By 1889, only four years after its establishment, the Scandinavian congregation had severed its ties to become an independent synod. With the dissolution of the United German and Scandinavian Lutheran Synod of Queensland and the return of its overworked and ill mastermind, Pastor C. Petersen, to Denmark in 1889, Lyng posits this as the end of a united Scandinavian Church in Queensland. ‘The story of the next decade,’ wrote Lyng ‘is one of decay – of disintegrating congregations – of Scandinavian churches disposed of or standing empty’. Bolstering the numbers of Scandinavian settlers to enter Australia during the 1870s to 1920s and maintaining such ideas of viable ethnic communities was, as noted above, difficult. Scandinavian migration patterns reflected opportunities that were largely dictated by the supply and demand of Australian immigration policies, which were in turn bound up with climactic and economic conditions. Consequently, immigration boomed and busted along with the land-based economy, and this had startling repercussions for those attempting to rekindle past connections through chain migration and community renewal. Assisted passages to Queensland, for example, were offered during the 1870s and 1880s, abandoned in 1892, and revived again in 1897. 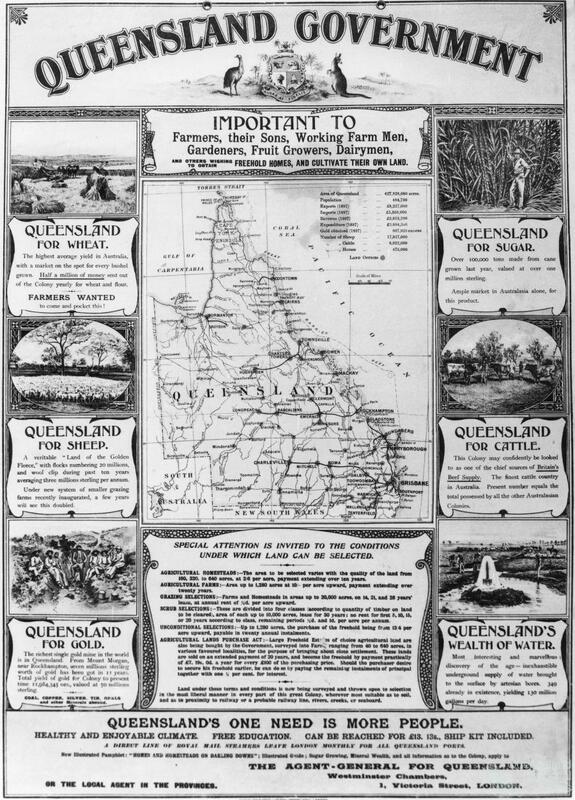 Until 1890, immigration was largely regulated by conditions in the originating homelands and in Queensland itself, and as a result each slight trade depression was reflected in a similar lowering in immigration rates. Lawson describes a ‘stop-go’ pattern of immigration that continued into the 1890s, and as Queensland’s economic conditions deteriorated rapidly in times of depression, the number of total assisted migrants was also reduced, from a total of 9170 in 1888 to 2919 in 1891. The severe drought and depression in 1892 caused assisted migration to be suspended in March of that year, and was not resumed until much later in the decade. Remarkably, during a small window of revived assisted passages between 1898 and 1901 more than 1000 new Scandinavians took the chance to immigrate, however, by this time the Queensland government was hardly able to support these new arrivals as it had almost run out of money. Despite their best efforts at attracting northern European migrants of a similar level to those in the United States, the Queensland government faced significant difficulties in promoting their colony to an uninformed and wary Nordic population. The largest, according to Koivukangas, was the simple lack of immigrant knowledge about Australia, let alone Queensland, in Scandinavia. Many immigration agents at the turn of the century were asked by prospective immigrants whether they would become slaves on arrival, or be pressed into fighting for the British army against the Boers instead of going to the Australian colony. To complicate matters, Queensland’s harsh and hot environment was deemed difficult for such migrants to endure. Consequently, many Scandinavian arrivals were seen to make use of the assisted passage program to gain entry to Australia, but then migrated internally to southern states shortly after arrival. According to P. B. Hansen, living conditions in Queensland were particularly severe, frequently causing already established Scandinavians to leave Brisbane for southern cities, seeking opportunities elsewhere. Furthermore, unfavourable reports from unsuccessful and unhappy migrants began to appear in the Scandinavian press, as the Nordic governments attempted to stem the excessive emigration of their citizens at a time of rapid late industrialisation. As a result of this negative backlash and generally poor results, the assisted migration program was eventually scrapped in 1901, and later emigrants had to pay a full fare. The assisted passage schemes were eventually handed over as part of the Commonwealth’s responsibilities in 1901. As Michael Roe infers, however, the handover was anything but simple; the all-important exclusion of undesirable aliens was a major object of early Commonwealth legislation, yet ‘other immigration matters remained in constitutional limbo, the Commonwealth having ultimate power but the states jealously retaining their de facto control’. Between 1906 and 1912, most states once again became enthusiastic towards assisted migration schemes, and national numbers peaked in 1912 with 92,000 immigrants; over 90% were British and approximately half were assisted. By 1920, Empire Migration schemes were also attempted; however, issues of state control and funding constantly undermined their efficacy and caused many to fail terribly. As such, into the twentieth century most migration settlement schemes were explicitly designed to strengthen British migration and develop a culturally homogenised British-Australian nation; despite being racially accepted, rarely did such schemes include provisions for Nordic migrants, who were required to self-fund their journeys. Nonetheless Scandinavians remained one of the largest groups to enter Queensland during the late-nineteenth century before their numbers slowly diminished during the early twentieth century. By 1925, the Scandinavian diaspora was coming to an end, and only a small trickle of Nordic migrants would follow in the ensuing decades anyway. Numbers would only begin to increase again after the 1980s, following another wave of Scandinavian immigration in the 1960s and 1970s. 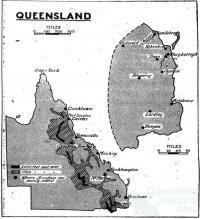 Queensland of the late-nineteenth century was possibly the most diversely populated of all the Australian colonies. Native-born jostled with immigrants from a wide spectrum of cultural backgrounds, and this included the largest population of Scandinavians to call Australia their new home. Whatever the issues faced by the Queensland government’s assisted migration programs, their success in comparison to the other states is still quite an achievement. Between 1898 and 1901, the more than 1000 Scandinavians that came to Queensland as assisted immigrants – refreshing Danish migrant communities substantially while fostering growth in the Queensland dairying industry – attest to the successes of what was in essence a troubled scheme. It is also important to reiterate that only Queensland provided such assisted passage schemes for non-British newcomers from Denmark, Norway, Sweden, Germany, and Switzerland. Due to this, Maximilian Brändle posits that colonial Queensland was a pace-setter in immigration and ideas of cultural pluralism. Between 1860 and 1919, only Queensland and Western Australia maintained a continuous policy of attracting migrants, and was a ... pioneer in seeking substantial migrant groups of non-British origins, notably from Scandinavia and Germany. This focus on encouraging immigration from a variety of sources greatly enhanced opportunities for those who wished to settle in the state and emphasised the diverse – if still heavily European and overwhelmingly ‘white’ – origins of the colonial Queensland populace.